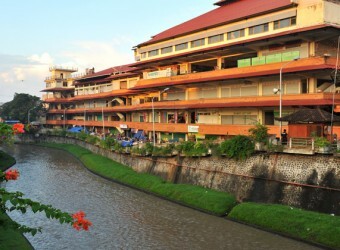 Kumbasari Market is located opposite of Badung Market across Badung River. Pasar Badung is busy from early morning, however, the shops of the market open daily at 9.30 am. As you visiting in a flea market, you can enjoy window shopping and look for something good. Everything doesn’t have price, and you should negotiate. However, most of sellers cannot speak English. There are various Balinese souvenirs can be found here and it was fun just looking. I bought Islamic scarf. It is winter in Japan now so I think I can use it when I go out. I really enjoyed Bali local atmosphere. There are so many small shops inside this shopping center. The shops sell Balinese crafts, painting, clothes, etc. I bought Bintang Beer tank top. It was the first experience for me to negotiate the price, and I negotiated the price using my guide book. It`s a shopping center to glimpse the local people daily life.